Inspirria Will Be Present At The Oracle Open World, Dubai - Meet Us To Explore The Possibilities! Oracle Open World is one of the most prestigious, and dynamic conventions organized by Oracle, all over the world. As on February 11th and 12th, this convention will take place in Dubai, where decision-makers, business heads, IT managers and key industry personals will converge, and discuss the future. We at Inspirria will be present at the event, to take the discussions around Oracle NetSuite and Cloud computing further. If you are around Dubai, then do attend this great event, and together, explore the possibilities with us. Oracle Open World: What It Is All About? Oracle Open World is World’s largest conference of Oracle customers and technologists, and in 2014, it attracted more than 60,000 visitors, and pulled in 7 million online viewers, from around the world. 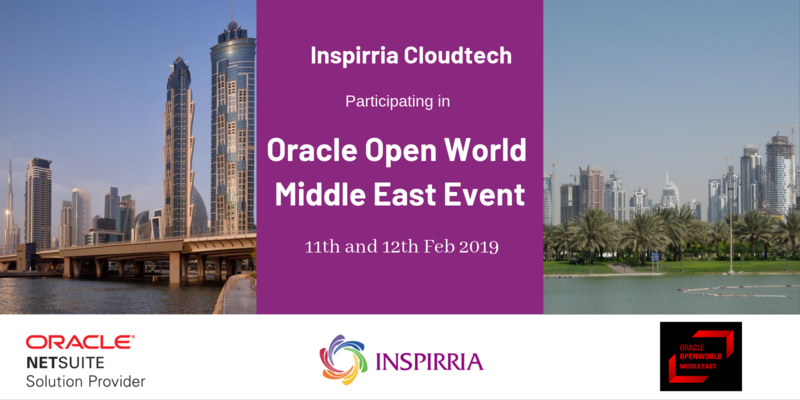 This year’s Middle East-centric Open World Oracle is being organized at Dubai on February 11th and 12th, and we at Inspirria are proud to be participants of this mega-event. Inspirria At Oracle Open World, Dubai: What Can You Expect? Oracle Open World is a unique amalgamation of technology and business, wherein decision makers and technologists will discuss the future of Cloud and NetSuite. Some of the most distinguished speakers and innovators have been invited for the event, wherein they will share their perspective of using Oracle NetSuite and other business management software by Oracle. Why Understanding Data Is Important: Small data and big data; every form and bit of data is crucial today, for every business. If you miss out on understanding, decoding data, you will be transported into the stone ages, instantly. Why Automation Is The Future: Machines are transforming everything, and robots are taking over the businesses. Automation is not a fad anymore - it has become a necessity in today’s hyper-connected businesses. Find out more about automation, and how we at Inspirria can help you deal with it. Speed Is The Catalyst: Momentum is the keyword in today’s business landscape, and if your business doesn’t have it, then you are out of the business. By attending Oracle Open World, you will realize how cloud products like Oracle NetSuite have changed the game, forever. Today’s business and technology are transforming at a greater pace, than ever. Success depends on resiliency, reinvention and futuristic vision, and by attending this dynamic event in Dubai, you will have a glimpse of the future. We at Inspirria have always been at the forefront of Cloud-based innovation and transformation, powered by Oracle NetSuite. Oracle NetSuite is a single and powerful cloud solution which combines the complete customer facing CRM with a back-office ERP and a self –service portals. This allows the companies to automate all the end-to-end processes. Oracle Open World presents a unique and valuable opportunity for you to explore the benefits of cloud solutions for your business. With more than 15 years of experience in cloud technologies, 110+ consultants and over 600 clients around the world, Inspirria has collaborated with innumerable global companies across industry verticals. Visit us at our booth at Oracle Open World Event, Dubai on 11th and 12th February for a demo.